You are here: Home / Blog / Blog / Eat A Sausage. Do It For The Animals. Fantasy #2: People aren’t being confused by these sorts of campaigns. Fantasy #3: This sort of campaign is not encouraging people to continue to consume animals. Fantasy #4: Animal welfare reforms are wonderful because they help animals suffering NOW!! I found these comments in less than two minutes. As of the time I wrote this, there were almost 3100 “likes,” almost 400 “shares” and more than 150 comments, many favorable. If anyone sees this as anything other than a breathtaking sell out of animal interests, I disagree. I have been accused of being “divisive” more times than I have eaten broccoli (and I love broccoli) for criticizing these sorts of things. If it “divisive” to draw a line between what I think and this stuff, I am happy to draw that line and be divided from these campaigns and those who promote this obscenity. Here is an essay written by an HSUS executive and a “happy” farmer praising “happy” meat. “H.J. 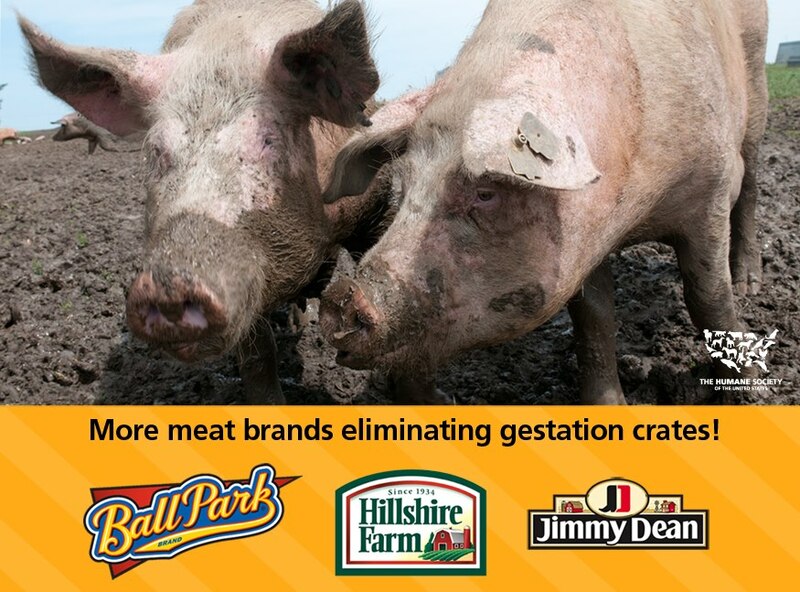 Heinz Co. this summer announced that it is working with its pork suppliers so that mother pigs no longer are kept in cramped crates as they give birth to litter after litter of piglets. This is a welcome new chapter in a story that’s been unfolding for a long time. When we teach our children about farm animals, we often employ old, familiar images: chickens pecking around in fields searching for bugs and seeds or pigs napping in beds of straw. These scenes are part of our agricultural heritage and at one time were an accurate portrayal of how farm animals actually lived. Unfortunately, these images and the reality of how farm animals now are treated on factory farms are radically different. So the “right direction” according to HSUS is a “happy” farm. Josh Balk is director of corporate policy for farm animal protection at The Humane Society of the United States and Philip Horst-Landis and his wife, Dee, operate Sweet Stem Farm in Lititz, Lancaster County, raising pigs, sheep and cattle. If you think that there is any doubt that HSUS is promoting “happy” exploitation as morally desirable, or if you think that the Balk/Horst-Landis essay is, in any way, consistent with promoting a clear message of veganism, you are in serious denial.